We would always recommend that you check your appliance temperatures periodically, and Refrigerator/Freezer Thermometers are the best way of knowing if any temperatures showing on your appliances are accurate. The WT4 Wall Thermometer is suitable for indoor and outdoor use and has a plastic construction with a fixture hole for hanging. It a non-toxic spirit-filled thermometer showing temperatures in °F and °C. The EFG120C Wall Thermometer is a non-toxic spirit filled economy thermometer with protective end caps and bold numbers for easy reading. The RFT2AK Refrigerator/Freezer Thermometer with Colour-Coded Zones will either hang or stand. The FG80AK Refrigerator/Freezer Thermometer is a non-toxic, spirit filled refrigerator or freezer thermometer that hangs or stands. The UTL80 Refrigerator/Freezer Thermometer with coloured-temperature zones for quick reading. 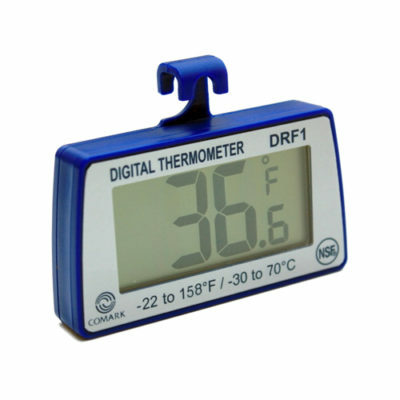 The DRF1 Digital Refrigerator/Freezer Thermometer is designed for use in your Refrigerator or Freezer, withstanding temperatures down to -22°F to (–30°C). Temperature Range: –30°C to +70°C / -22°F to +158°F. 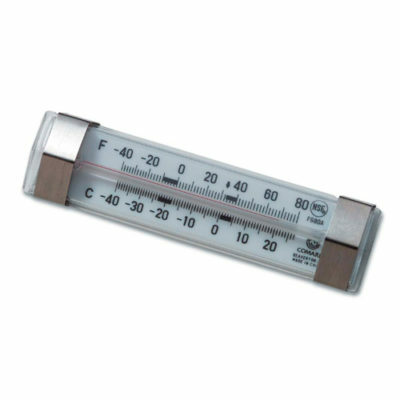 A fridge or freezer thermometer should be placed near the centre of the unit. A free-standing thermometer could be placed somewhere near the vertical centre of the appliance. Thermometers with a hook might be hung from the middle shelf or the shelf immediately above the vertical centre. A thermometer that adheres to the sides of a fridge or freezer might be placed half way back horizontally between the door and the back of the unit and again close to the middle if possible. Fridges and freezers have some temperature variation, typically being a little warmer closer to the door and a little cooler at the back or near the bottom. A central position gives a good indication of the mean average temperature of the unit. Once placed it will take time for the unit to measure the correct temperature. Ideally the fridge thermometer will be left with the door closed for several hours before being checked. Ideally you would leave the appliance closed overnight and check the following day. The temperature read on the thermometer, once sufficient time has been allowed for the reading to normalise, should be cross checked against the desired temperature set using the appliances thermostat. Any large discrepancy between the desired temperature set on the thermostat and the temperature reading on the thermometer might indicate a fault with the fridge of freezer that needs addressing. You should always try to ensure that you keep your appliances at the proper temperatures. Your refrigerator temperature should ideally be kept at or below +4°C/+40°F*. The freezer temperature should be kept at -18°C/0°F*. We would recommend that you check your appliance temperatures periodically. Refrigerator/Freezer thermometers are the best way of knowing if any temperatures showing on your appliances are accurate. All fridges and freezers come with an in-built thermostat. A fridge-freezer will likely have one for each function. The temperature for each can be set independently. The role of the thermostat is to allow the user to set the desired temperature for the appliance. A thermostat is hard wired to the cooling mechanism, normally a compressor, and regulates it to turn on and off to achieve this desired temperature. A thermostat alone, however, does not guarantee that the desired temperature is reached or maintained. Most fridges and freezers do not display the actual temperature, but rather the desired temperature as dialled in by the user. When a unit if faulty there can be a substantial difference between the set temperature and the actual temperature leading to food being spoiled. Either not sufficiently cooled, or over frozen. Without a fridge thermometer there is no way of knowing for certain whether the temperature dialled into the thermostat is being achieved. A fridge thermometer is a vital component to ensure your food is safely stored. 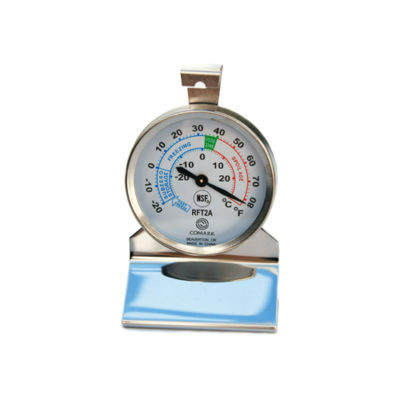 Types of Refrigerator Freezer Thermometers. Often a traditional looking thermometer with a coloured liquid visible in a narrow capillary style tube graduated with temperature. The higher the liquid rises, the higher the temperature. Spirit is a safe alternative to mercury which is no longer used in commercial thermometers in a food environment. Comark supply a range of thermometers both with modern LCD digital displays and traditional analogue dials. A digital fridge thermometer will typically give the temperature to within one tenth of a degree. A digital fridge thermometer will require a power supply, normally a 3 volt button cell. 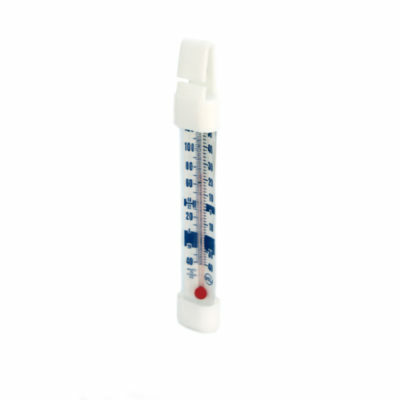 An analogue fridge thermometer will have either use rising spirit in a graduated tube or a dial gauge with a pointer to show the current temperature. Spirit thermometers do not normally require any power supply. 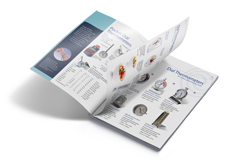 Comark’s range of fridge and freezer thermometers come with a one-year warranty. Temperatures can be read in either °C or °F. Most come with an IP65 rating for protection against spills and leaks inside your fridge and freezer. 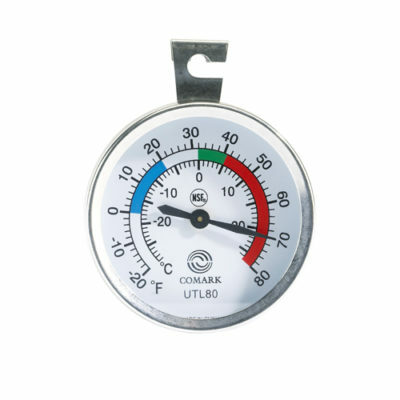 The temperature range for each Comark thermometer is listed in the technical information for that thermometer.